The Spontaneous Sound of Uncontrived Song: A Lament Recalling the Great Guru of Oḍḍiyāna was composed by His Holiness Jigme Phuntsok Rinpoche at Tso Pema, India, in 1990. Please click here to watch Khenpo’s teaching on this song. 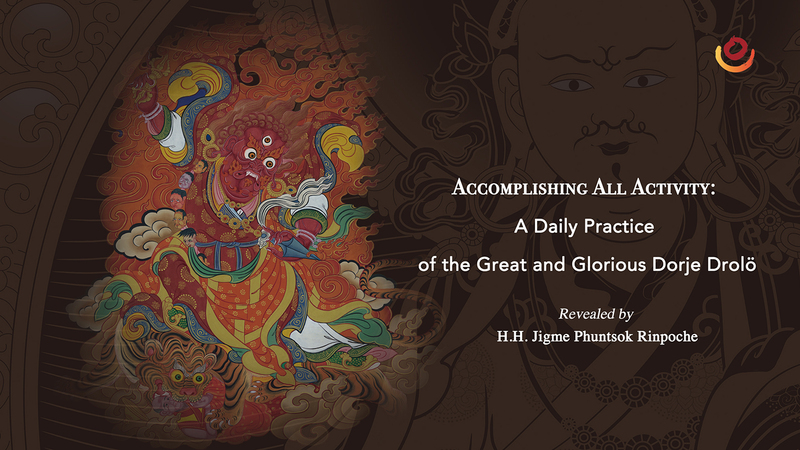 Accomplishing All Activity: A Daily Practice of the Great and Glorious Dorje Drolö is a terma revealed by His Holiness Jigme Phuntsok Rinpoche at Paro Taktsang, Bhutan, in 1990. Please click here to watch Khenpo’s teaching on this practice.